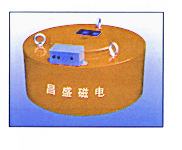 Series RCDB dry electric-magnetic iron separator is used to eliminate the powder or massive waste iron weighing from 0.1kg to35kg from the nonmagnetic material. The inner with wholly sealed structure uses the special resin to cast. Featuring with revealed deep magnetic depth, strong magnetic force, dust and rain-protection, wearing eerosion and so on, it can run in the harsh environment. The main technical criteria is beyond or meets the JB/T7689-95 Standard.